I've been busy making stuff, though. Wanna see? Paradise Found. The Chewy Chocolate Ginger Cookies on the cover? Knitter tested, knitter approved. 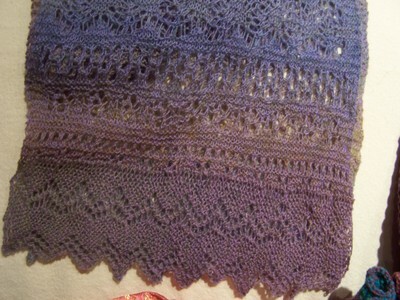 "Blueberry Puffs"; Colonial/Merino blend; 127 yds--3.5 oz; heavy worsted weight 2-ply; purchased from Copper Pot Woolies. 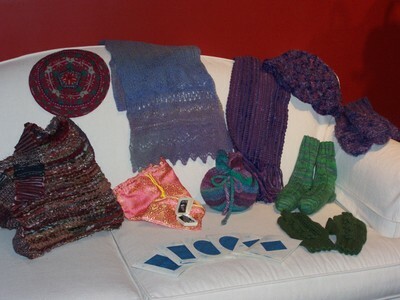 And surprisingly, some knitting. 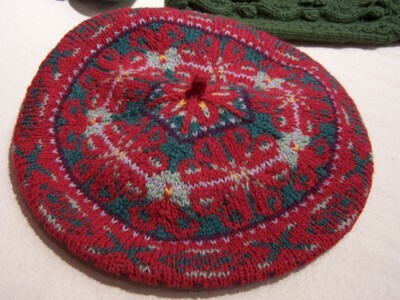 Finished knitting, at that. Yes. Right now, for me, one sock counts as finished knitting. A little variation on a plain vanilla--a little twisty bit every other row. The second sock may lag a little--this is Blue Moon Sock Candy, a 96% cotton, 4% elite (spandex) blend in Lemongrass. This is the first time I've knit with this yarn, and it's just okay. 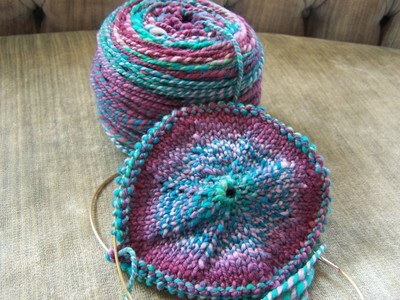 It's hard for me to wrap my mind around tension when there's a whole bunch of sproing in the yarn. These socks are for my sister, Jess, who had a birthday last week. I know. I'm giving myself a little pat on the back right now. It's almost like I'm ahead of schedule. Nothing says your mind's on work like having detailed dreams about the rising cost of postage. That's right. Full-on altercations with the Postmaster about having to buy a roll of 1-cent stamps. We're talking knock-down, drag-out, people. For those of you who are still worried about the price increases, don't be. In my dream, I figured out a way to bypass the 20-cent Priority Flat Rate increase. I discovered that I can use the suction-thingy in the bank drive-through lane (free of charge, no less!) to send packages to Holland, MI. Clever, huh? 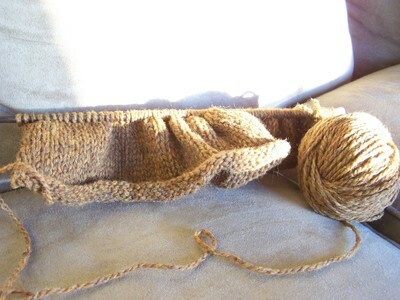 On Saturday, I couldn't decide on which of my 20-odd unfinished project to knit, so I started a new sweater. As it turns out, this was not what I was looking for either. Some birthday fiber last year from my sissies, purchased here. I'm restless, and for no good reason. I really need some serious focus, and the only way to get there, I fear, is to be knocked over by a strong case of finish-itis. Or coffee. I can do coffee. *For the record, my dreams are not an indicator of my "true" feelings toward the Cedar Postmaster. I really like Pete. Nor do they reflect my thoughts on the recent stamp increase--it's a penny. It's not worth losing sleep over. I know. I'm not sure how it happens, either. I have absolutely zero knitting bits to share. So, a List. 1. Husband left on Wednesday for an overnight school field trip. Don't get me wrong--I wouldn't kick this guy out of bed for eating crackers--but having the house to myself for 24 hours was glorious, filled with all those dreamy tasks that one can only do when totally alone, such as eating cereal for dinner, singing along to Ben Folds in the shower and organizing your secret stash (don't pretend you don't have one!) according to fiber content. 2. Curt's absence also gave me the opportunity to scrub the house from top to bottom. And there ain't nothin' more satisfying than a squeaky clean house. 3. The Close Knit Guild's birthday party. Never before have I been in a group that knows each other as well as this one does. Fabulous gifts, fabulous company--and the birthday cake wasn't half-bad, either. 4. The purchase of this book. It should be (if it hasn't been already) dubbed this year's decade's Book of Epic Proportions, Knitwear Division. Or Sweaters To Clothe Generations Past, Present and Future. Or, When Stranded on a Desert Island and You Could Only Bring One Knitting Compendium, How Could There Possibly Be Another Choice? Not only are these patterns strikingly beautiful, classic and exquisitely thought-out, but every single pattern is showcased twice--once in a commercial yarn and once in HANDSPUN. Yeah. Crazy. 5. The article that was published in Wednesday's Record Eagle! 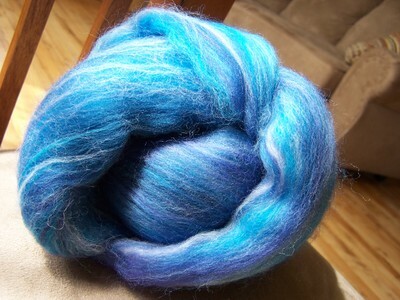 Hopefully tomorrow I will have a little spinning nugget to share. I've been off the wheel all week, and it kinda feels like being on the wagon. They are well-versed in the art of gift-giving. Seriously. Best First Annual Close Knit Guild Birthday Party ever. Kathy to Bobbie. 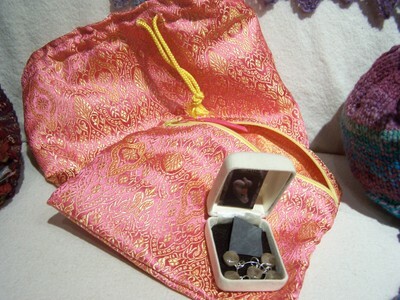 Handsewn set of silky project bags & set of Petoskey stone stitch markers. Pockets inside of pockets, people. Bobbie to Laura. 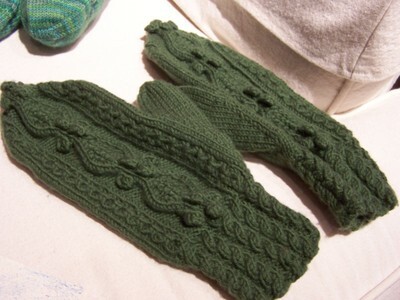 Bobblicious Aran mittens. They fit her like, well, you know the cliche'. Jenny McCain to Elizabeth. 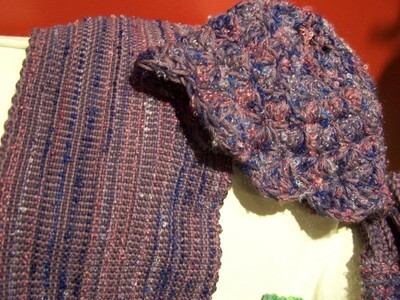 Handwoven scarf, crocheted hat & mitten set from Elizabeth's hand dyed yarn. Mittens are absent here, as the closeup was too fuzzy to do them justice. Elizabeth to Norvilla. Tote bag knit from fabric strips--with a woven strap. 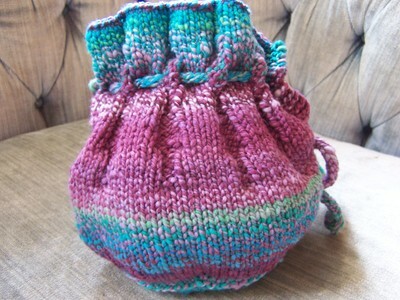 Too bad the blessed man-drape is complete--this roomy bag would have come in handy. Norvilla to Jenny. Her first lace knitting attempt success. Brat. Jenny to Daryl. 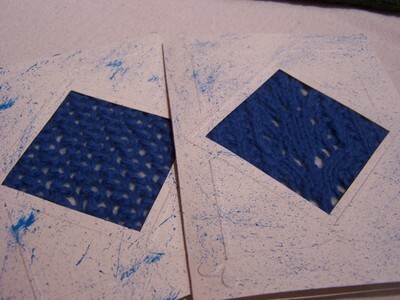 Knit notecards. Quote, "You know, Jenny, no one is ever going to be getting one of these cards...."
Daryl to me. The March installment of the Rockin' Sock Club. I can't tell you how much I love these socks. 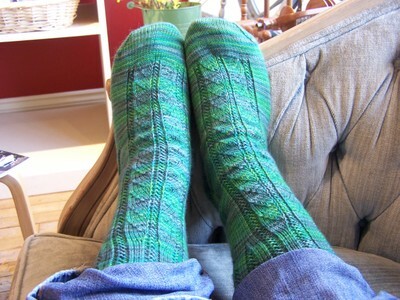 More than any other pair of handknit socks I own. Mostly because I didn't knit them. They are soft, squishy and fit my feet perfectly. And STR mediumweight? Love it. Another thing I love? 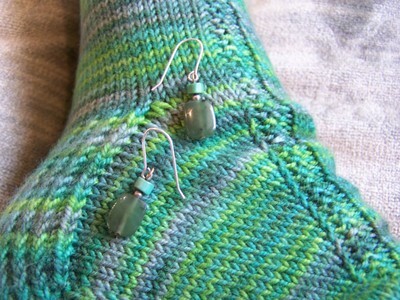 Matching my socks to my earrings. What? Favorite Earrings, meet Favorite Socks. They're new in town, but I can tell already you two are going to hit it off. Thanks, Daryl, for such a fabulous gift. 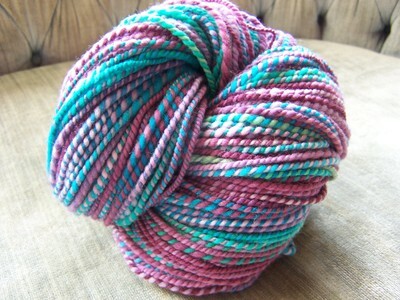 Yarn: "Mad Hatter", my own handspun; 222 yds, 4 oz. 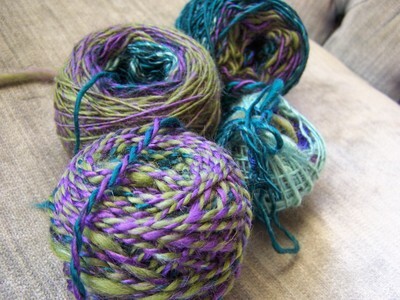 ; 100% Merino wool from Freckle Face Fibers in color Mystic. Spun on Chauncey, my Schacht Matchless DT. Gauge: 18 sts=4 in. on US 7. Size: To fit a large (8-10 cup) teapot. This is as far as I can take you. For now. I don't know whether the recipient reads this blog or not, but just to play it safe, I won't be posting any more progress until Tuesday afternoon. Come to think of it, she wouldn't know either, as the drawing was Secret Santa Style. 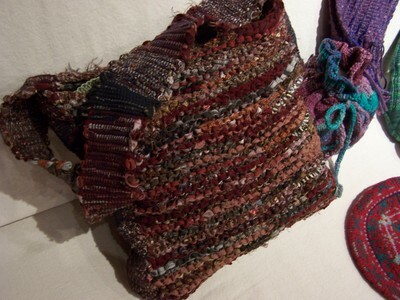 But, friend, if you do recognize this gift after you receive it, please know that this project provided me with several days of blog fodder and hypnotized my mind, body and soul made for the most enchanting fiber pursuit I've pursued in a long, long time. 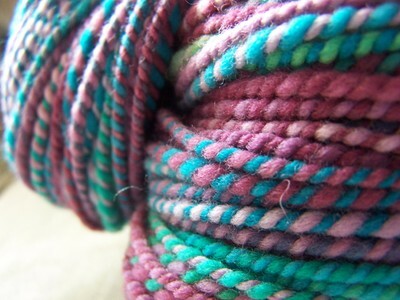 There are not enough words to describe the profound love surging inside of me for this yarn. So twisty. And squishy. And lovely. And bright. I'm so proud, it's almost as though I've created a yarn child. My most favorite yarn child. But this child? 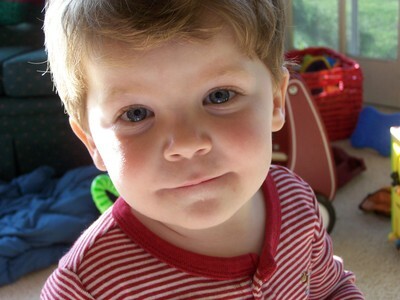 This child right here? He's my favorite. 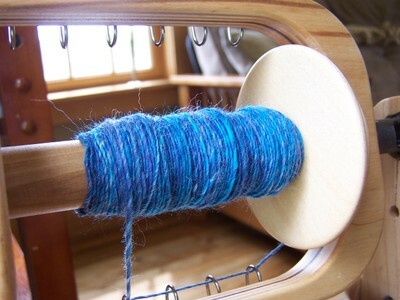 In all honesty, I think the real problem was that I couldn't exactly tell how the yarn should be spun. So I took the lazy route and settled into the method that's most comfortable to me, which doesn't really jibe with this fiber combination. 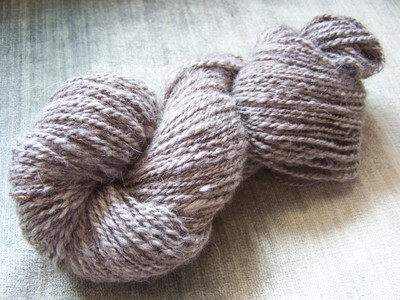 The yarn is not balanced (over-plied), heavy (four ounces!) and visually flat. 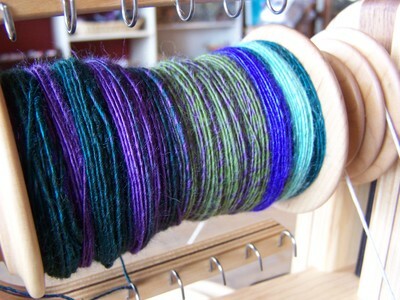 But maybe tomorrow, when the skein is actually dry and smells a touch better than wet dog, I'll actually like it.